On Feb. 27 at 7 p.m., a group gathered in Harned Hall. Composed largely of local community members, a handful of students, and at least one Saint Martin’s University faculty member, they trickled into a classroom on the first floor, greeting one another and offering refreshments. The event, sponsored by The Interfaith Movement club (TIM), was a showing of the documentary entitled, “To Light a Candle,” by Maziar Bahari. 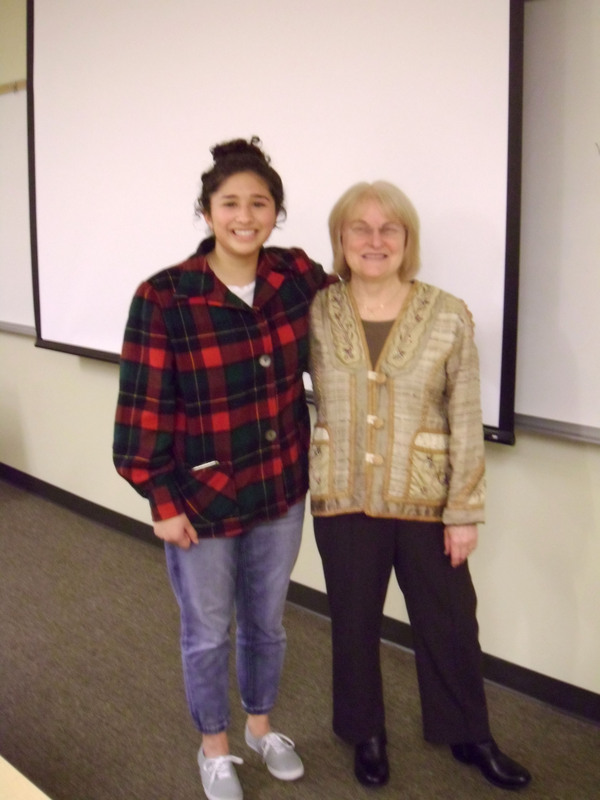 Chantal Arevalo, secretary of The Interfaith Movement, and Belinda Hill, Ph.D. This movie portrays the plight of the Bahá’í people living under an oppressive government in Iran. Associate Professor of Education Belinda Hill, Ph.D., proved influential in bringing this documentary to the attention of the club. Hill is a member of the Bahá’í faith community and has been involved in the Bahá’í Institute for Higher Education (BIHE). As Hill introduced the documentary, she focused on the importance of being involved in fighting injustice. She asked those present to consider what they might be able to do, not only concerning the situation of the Bahá’í people, but also in other areas of injustice in our world. Following her introduction, another member of the local Bahá’í community read a poem by Mahvash Sabet who is serving a 20-year prison sentence in Iran for educating Bahá’ís. The collection, “Prison Poems,” was published on the fifth anniversary of her 2008 arrest. “Lights Out,” the poem in question, soliloquizes life in prison and the protracted longing for the call, “Lights out!” in the evening. “You can’t see the sorrow after lights out,” Sabet writes. Then, the time came to watch the documentary. “To Light a Candle” gives a summary of historical details regarding the Bahá’í faith—especially in relation to the nation of Iran—and follows the stories of several Bahá’í people who have experienced suffering for the sake of their religious beliefs. Although the Bahá’í faith originated in Iran, it has become a global religion with about seven million believers around the world. Baha’u’llah founded the religion in 1863, and although Bahá’ís have experienced varying degrees of difficulty since the 19th century, the level of religious persecution in Iran heightened after the Islamic revolution in 1979. As a result, many Bahá’í people have been forced to relocate. Kayvan Rahimian and several of his family members play an important role in the storyline of the film. Rahimian’s father, Rahim, was arrested when Kayvan and his brother were still young. Rahim endured terrible torture and was ultimately executed in the fall of 1983. During this time, the Iranian government engaged in a systematic pattern of oppression, frequently arresting and executing Bahá’í leaders. As the violence against Bahá’ís in Iran gained publicity, people around the world became interested in their suffering. Due largely to the weight of public opinion, the Iranian government was forced to stop mass executions in 1986. They were not forced to encourage prosperity and progress for the Bahá’í people, however, and Iran has consistently barred Bahá’ís from gaining a higher education. According to their website, BIHE was founded in 1987 due to “the Iranian government’s continuing campaign to deny Iranian Bahá’ís access” to a college education. In its earliest stage, BIHE degrees were not considered legitimate in Iran or in other countries. By the mid-1990s, however, a number of universities around the world began accepting BIHE degrees. Despite Iranian propaganda against BIHE, arrests and imprisonment of Bahá’í students and educators, and the continual vandalism of businesses and even burial grounds, the Bahá’í people continue to thrive. Youcan assist the Bahá’ís in their fight for equal rights by supporting the #EducationIsNotACrime campaign, along with Rainn Wilson, Archbishop Desmond Tutu, and many others. Visit the website at http://educationisnotacrime.me/ to learn more, or check out the video “Educators in Prison,” by Aziz Tebyanian, a short documentary dealing with Bahá’í educators as well as educators of other religious groups who have suffered for taking a stand. You can access this video at https://www.youtube.com/watch?v=uT4F6WL8BKI.